UK's largest apparel retailer Marks & Spencer said its "cotton sustainability project" in Warangal district of Andhra Pradesh had started bearing fruit. The company is ready to increase the number of farmers under the project from 1,500 to 10,000. The two-year-old project, rolled out with WWF India as the local partner, has enthused the retailer to consider such projects in other cotton-producing areas in India and other parts of the world. The core of this project, according to M&S' sustainable raw material specialist Mark Sumner, is better use of water by farmers in Warangal - an area that depends mostly on rain water for crops. After two years, Sumner said, water use was down 50 per cent, pesticide use fell 80 per cent and synthetic fertiliser use was down 20 per cent. A fully functioning farmers' cooperative has also been established across 28 villages. Cotton, along with rice and sugar, is among the top three water-intensive crops in India. M&S' clothing and homeware business reported a top line of £4.1 billion, or nearly half the group's turnover of £9.5 billion, in 2009-10. Based on the size of its apparel purchase bill, M&S believes it can assert how inputs for its merchandise are produced. Cotton is among the biggest raw material for M&S products. "The economic strength of farmers has been increased through the cooperative, with less dependence on chemicals and an increase in farmers' gross margins. So, the next step is to prove these results can be repeated with other farmers; and also increase the number of farmers we work with. We are also investigating ways we can take lessons from the project and apply it to other areas and other cotton projects," Sumner said. At present, 7,000 acres crop is under the project in Warangal. The project is a joint venture with environmental charity WWF, implemented by WWF India. Sumner said the financial commitment to the project could not be revealed, but said the investment M&S was going to make was "significant". The project in India is part of a three-year-old exercise, called Plan A. Earlier this week, while reporting the annual progress of its Plan A project, M&S said it achieved a 20 per cent reduction in food packaging, a 19 per cent increase in energy efficiency in stores and use of 417 million fewer carrier bags. Besides, over pound 50 million profit was invested back in the business. A further pound 13.2 million was invested in community projects last year, equal to 1.9 per cent of adjusted pre-tax profits. M&S said over the last three years, 62 of the original 100 commitments had been achieved, 30 were 'on plan' to be achieved by 2012 and seven were 'behind plan' as a result of unexpected challenges. Plan A was extended in March this year to incorporate 80 new commitments and extensions. M&S is one of the leading retailers in the UK, with over 21 million people visiting its stores every week. It employs over 75,000 people in the UK and abroad, and has over 600 UK stores. 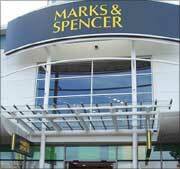 Since 2008, M&S has had a joint venture with Reliance Retail, with the Indian partner holding a 49 per cent stake.